MakeMyTrip Ltd is India's very own golden goose. Ever since its blockbuster IPO last year, the company has been tracked by Internet analysts and researchers across the globe as a representative of the country's growing might in the online domain. It has grabbed more attention by stepping up on acquisitions this year â€“ first with the $3 million deal for Singapore-based Luxury Tours & Travel Pte Ltd and then by snapping up Gurgaon-based Le Travenues Technology Pvt Ltd, which owns and operates travel search engine iXiGO. 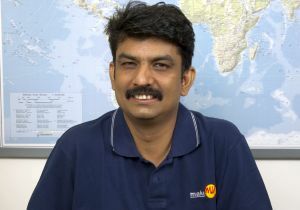 In an one-to-one interaction with Techcircle.in, MakeMyTrip's CFO Rajesh Magow talks about the company and its acquisition strategy, soaring additions of hotels to its network, the Internet penetration in India and the company's investment plans going forth. It's been a year since the listing on the NASDAQ. How is MMT faring? Historically, our performance has been good. In fact, we are on track for a growth expansion on a higher base. In the last quarter, we have seen a phenomenal rise in terms of revenue, transactions and other growth factors. So, it's been pretty good so far. The total traffic (as per the Directorate General of Civil Aviation, Government of India) in domestic air grew 15 per cent but we saw a growth of 30-35 per cent. Also, we have significantly improved our market share to 11.5 per cent of the total domestic air market. All other airlines are growing well and looking at the orders they have placed, the outlook is good. After five years, they will start to fly overseas. Overall, we are well poised to sustain our leadership position. Would you say that the fall in profits is not a matter of concern? In the first quarter, we spent a considerable amount on a TV campaign. It was a planned, strategic move on an area of growth from our side and we ended up spending incrementally. We spent around $1.7 million and it had a temporary impact on our profits. We will continue to spend more on marketing, though. What are the emerging trends you have seen and what is your strategy to tap the wind for MMT? As far as trends are concerned, we have seen the change in consumer behaviour. In general, they are spending more time on the Internet and there is a lot of interest when it comes to online queries. Previously, they would pick up a form and call us. But now, we are getting more queries online. More research is happening now and people themselves are looking for information on travel destinations. So, we have introduced end-to-end booking engines for holidays with fixed departures. But this is not necessarily going to be introduced for customised packages. So, Internet usage is growing. But how does MMT help grow the user base? Can you tell us how the hybrid model is working out? Internet penetration in India has improved from 7 per cent last year to 8.5 per cent today (and 80 million to 100 million users). It is likely to grow to about 20 per cent in the next three-four years, according to some industry reports. But most importantly, we are witnessing broadband growth. This, along with the 3G and the smart phone growth in the near future, will help online buying experience significantly and attract more and more people to Internet shopping. Our strategy of using the hybrid model via multiple channels (call centers, retail offices and B2B network) is essentially for expanding our customer reach and bringing them online over time as the Internet penetration improves. But I cannot share any more information. Tell us where you stand in terms of traffic and transactions, compared to Expedia, Yatra and Cleartrip. We are the leader with 48 per cent share in the OTA market. Our traffic and transaction growth has been robust in the last few quarters which, we believe, is a result of staying focused on delivering better products and quality customer experience. Can you tell us more about the upcoming site revision? What are the new features being launched? The site review is based on product innovations, customer interactions and in-house research. We have introduced section-by-section improvements on the UI side. And we will be rolling these out in a phased manner. We have been looking at how to make the customer experience better and have focused on the areas which we need to improve. We have planned a capital investment of $2-$3 million for this initiative. How are you bringing hoteliers onto your network? Tell us about your heightened hotels focus. Bringing hotels from offline to online is growing well with the Internet penetration rising and spends increasing. These are the factors which are helping us to grow the network. On the hotels and packages side, we have been doing well in terms of product mix. The net revenue contribution of hotels is now 25 per cent, as compared to 15-20 per cent six months ago. This is our core strategy. In terms of transactions growth, we have seen 72 per cent rise in transactions in the last quarter. We now have 4,700 Indian hotels on the network. We add 100-150 hotels per month, but will now add 500 hotels a month. So, two months from now, we will have 7,000-8,000 hotels. We will also launch a drive to add more from a content perspective. Right now, we have 15-20 marketing managers across India and that should help. How do you see the future of holiday booking? Are review sites affecting ticketing sales? MakeMyTrip also features reviews and we source content from Oktatabyebye.com. We will continue to build on that. What's the cost of customer acquisition today, as compared to last year? Also, what are your average transaction sizes â€“ global versus India? The cost of customer acquisition is derived from our total marketing spend as a percentage of net revenues, which has actually dropped. Between 2008 and 2011, we had made quite a few improvements and in 2010, the marketing spend as a percentage of net revenues stood at around 24 per cent. But it is now 20 per cent. Our repeat rate is also up at over 50 per cent today. As for average transaction sizes, our air ticketing segment is a combination of the US and Indian business. Typically, we see domestic packages in India go up to Rs 25,000 whereas overseas trips to South-East Asia or short haul trips cost between Rs 35,000 and Rs 40,000. On the other hand, long-haul trips to Europe cost between Rs 65,000 and Rs 80,000. What is MMT's strategy for international markets? For now, we are extremely focused on the Indian market and investing heavily in an inorganic strategy. There are three buckets when it comes to acquisition. And the first involves companies in the South-East Asia where we are focusing on the supply side and not necessarily to enter the market. This includes Malaysia, Bangkok, Hong Kong and Singapore. We have acquired Singapore-based Luxury Tours & Travel Pte Ltd as a margin expansion strategy and we will continue to look at potential acquisitions in this area. The second bucket is technologically innovative companies. For instance, iXiGO is an example of a team and technology which we can leverage to grow our non-air side of the business. The final bucket is regional players who target hotels and own a set of prime customers which add value. There is a huge potential still left in India. Even if it slows down, we will still grow as the country is still a growth story. There is a lot of demand here. So, we will continue to focus on India and even if we go out, it will be to support the Indian market. What are your organic expansion plans? On the organic side, we will continue to ramp up all relevant areas in line with business growth. But I cannot share more details. What is your take on the current e-commerce boom and the rising start-ups? How many have you partnered with for deals? Do you have any incubation plans? The current Internet/e-commerce boom seems more real than it was in early 2000 due to an evolved ecosystem and visible broadband & 3G roll out plans. Investors today are able to see the potential along with demonstrated performance, instead of relying on mere ideas. But those who simply jump in because of the hype, will fail if they don't have a robust business model or execution strategy. Via has recently announced that it will set up more e-commerce sites. Are you also considering the same? No, we are focused on travel as we see huge untapped opportunity in this space.